SPWAO Showcase [#8½, 1993] ed. Thomas M. K. Stratman & Mark Olson (Shawano, WI, $4.00, iv+52pp+, quarto, cover by Ted Guerin) The Chaser. Star*Line [v16 #1, Jan./Feb. 1993] ed. Marge Ballif Simon (SFPA, $2.00, 20pp, octavo, cover by ?) Partial contents, issue not seen. Star*Line [v16 #3, May/June 1993] ed. 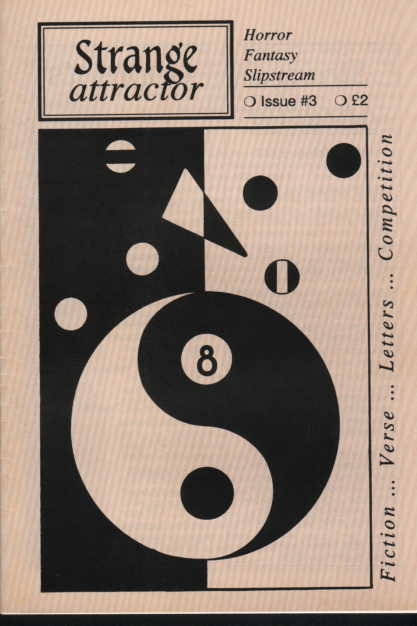 Marge Ballif Simon (SFPA, $2.00, 20pp, octavo, cover by John R. Borkowski) Partial contents, issue not seen. Star*Line [v16 #6/7, Nov/Dec 1993] ed. Marge Ballif Simon (SFPA, $2.00, 36pp, octavo, cover by Cathy Buburuz) Special double issue with prose poetry. Strange Attractor [#3, March 1993] ed. Rick Cadger (Cadger, Rick, £2.00, 54pp, A5) Small press dark fantasy/horror fiction magazine. Available from Rick Cadger, 111 Sundon Road, HOUGHTON REGIS, Beds, LU5 5NL. 28 · An Interview with George Alec Effinger: Part I · Eric M. Heideman · iv [George Alec Effinger]; edited from the Guest of Honor interview at Minicon 26, Mar 30 91. 26 · An Interview with George Alec Effinger: Part II · Eric M. Heideman · iv Tales of the Unanticipated #11 93 [George Alec Effinger]; edited from a discussion at Minicon 26, Mar 31 91.